And so another late night found us at the office in Makati, and at times like this we need Juicy Fruit gum. Errr... make that dinner. We were cruising aimlessly by, our minds as blank as our tummies as we searched for a place to have dinner. 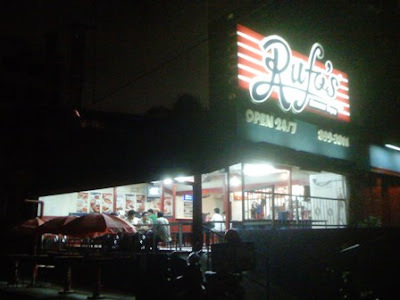 And this was how we came to Rufo's Famous Tapa at Kalayaan Avenue. Tapa is actually cured, bite-size meat pieces that are deep-fried, usually beef. It is often served with fried rice and egg, a combination called Tapsilog (Tapa-sinangag-itlog) which looks like a breakfast item but is served and enjoyed anytime of the day (or night, for that matter). I am a firm believer that Tapa King is the undisputed king of Tapa (pun intended). 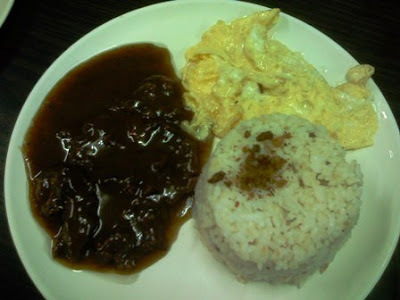 I love their original recipe Tapsilog and the spicy version (Tapa Queen). 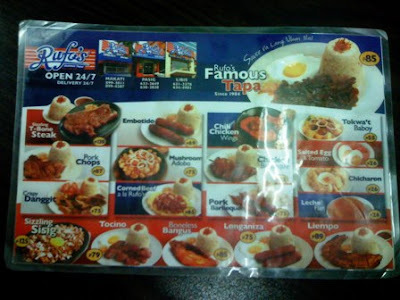 So how does Rufo's famous tapa measure up? 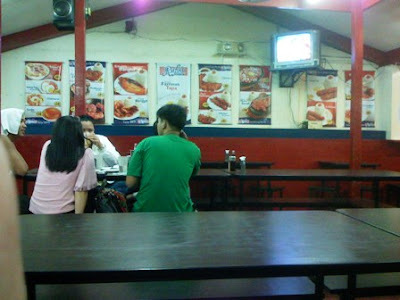 At P85.00, it certainly is cheaper than Tapa King's. And oh, I like my egg scrambled. I'm one of those guys who eat up only the whites and leave the yolk sitting by its lonesome when served with sunny side-up. And here's the Tapsilog... there is something definitely unique here. Their tapa has sauce on it! Of the many Tapsilugans that I have dined in (from restaurants to side-street fare), I have never had tapa with sauce on it.